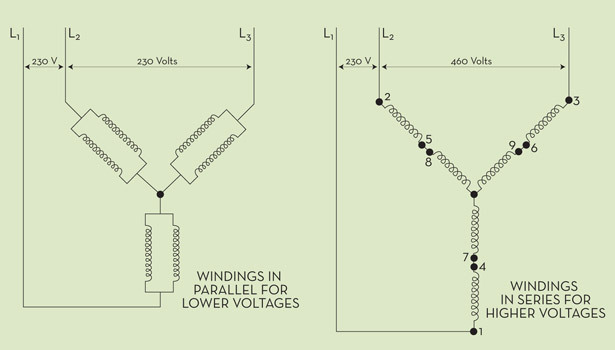 Understand that if you RECONNECT a 460V motor as 230V, yes, the current in each phase doubles, but so do the NUMBER OF COILS used in parallel within the motor, so the current on EACH WINDING remains the same. The section you quoted leads me to believe you interpret me as condoning running a motor at half it's voltage and double its current. That is NOT what I'm saying, and I'm not talking about reconnecting it for 230V. What I am saying, is that (efficiency and 3ph equations disregarded) If you ran a 4.8kw/480V/10A motor with a 1.25 sf at 4.8kw/240V/20A (still wired for 480V), it would burn up despite being ran below the the specified service factor. Therefore service factor can only apply to amps, not HP/Kw.